Our friend Gavin Gear of UlimateReloader.com recently visited a SilencerCo dealer in the state of Washington, The Range LLC in Yakima, WA. 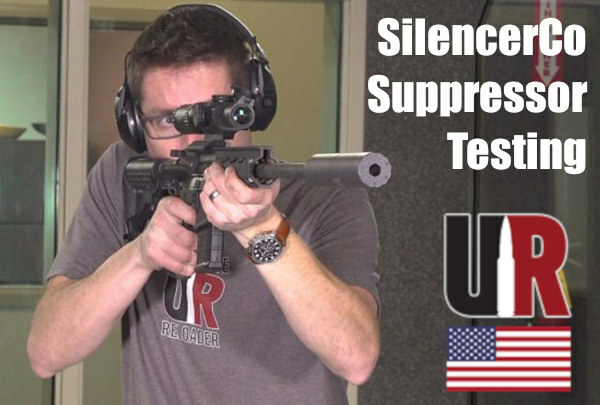 Gavin was able to test a number of suppressors (aka “moderators” or “silencers”) for both rifle and pistols. Gavin recently released a lengthy article covering his experiences. If you are in the market for a suppressor, we highly recommend you read Gavin’s SilencerCo Products Overview on UltimateReloader.com. 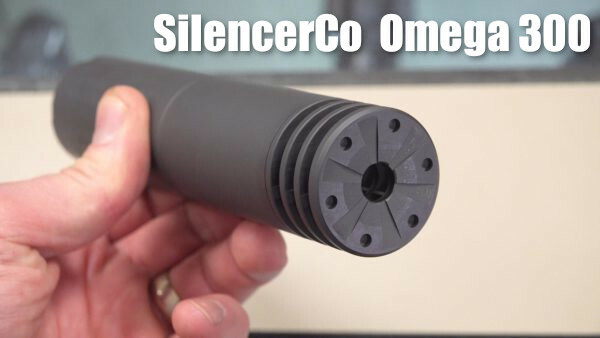 Gavin was able to test three SilencerCo suppressors: the Omega 300, the Hybrid, and the Osprey 45. In addition Gavin was able to handle the Maxim 9, an integrally suppressed 9mm handgun. Gavin reports the Omega 300, which is rated up to .300 Winchester Magnum, is a very popular “can”. According to Gavin, the Omega 300 has become the best-selling rifle suppressor in history for important reasons. First, it has an integral muzzle brake. Second, it can work for multiple calibers, from .223 up to .308. Third, “It is very tough — .300 Win Mag rated, and full-auto rated”. Share the post "Hands On with SilencerCo Suppressors — Range Time in WA"
When is a single-stage reloading press worth close to a thousand bucks? When it’s made in Germany with CNC technology and crafted to aero-space precision standards. UltimateReloader.com’s Gavin Gear recently got his hands on a Turban 120mm Heavy Präzipress. This unit retails for 850 Euros (850,00 €), about $960 at current exchange rates. Gavin put the Präzipress through its paces, and came away VERY impressed. READ FULL REVIEW HERE. Sizing once-fired 6.5mm Creedmoor cases with the Präzipress, Gavin achieved great results for shoulder “bump” consistency. The sizing results were nothing short of spectacular. After zeroing the first of ten cases, the remaining nine were essentially identical, showing as “0.000”, meaning less than half a thousandth of variation. The Präzipress also delivered ultra-low run-out when seating bullets using a Forster die. On all ten test cases, the run-out was +/- 0.001″ (one-thousandth) or less. 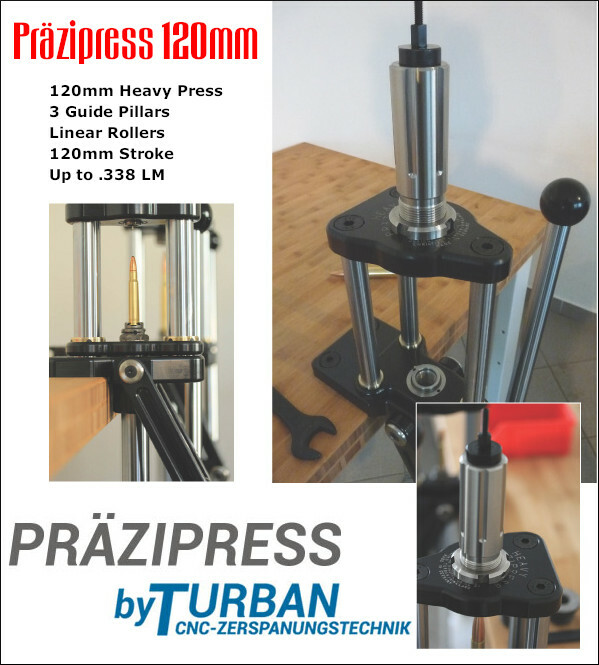 Share the post "Mercedes of Reloading Presses — $960 Turban Präzipress"
The .224 Valkyrie is the “trendy” cartridge now for AR shooters looking for better long-range performance than the standard .223 Rem (5.56×45) can provide. With the right bullets and load, the .224 Valkyrie offers significantly less drop and drift at long range. 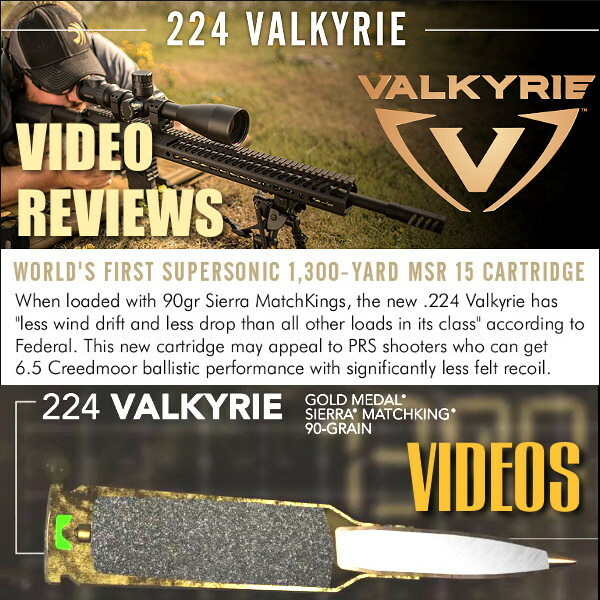 The .224 Valkyrie is basically a 6.8 SPC case necked down to .22-caliber. You can use your existing AR15 lower, but you will need a dedicated .224 Valkyrie upper, or at the minimum a new barrel, modified bolt with proper bolt face, and 6.8-compliant mags. Here are five videos featuring the .224 Valkyrie cartridge and rifle options. 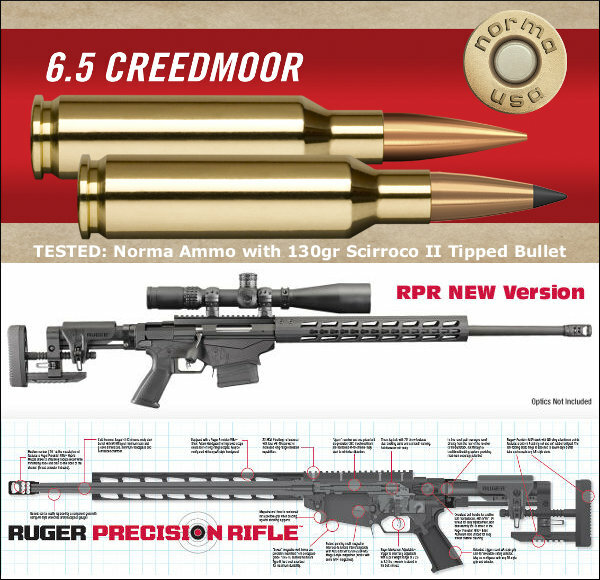 We think the two applications that make most sense for this new cartridge are: 1) PRS Gas Gun matches (Open Class) — you get 6.5 Creedmoor ballistic performance with much less recoil for faster shot transitions; and 2) Long-Range (400+ yards) varminting — you get performance similar to a 22-250 in a cartridge that works with your existing AR15 lower. That will really help with those long shots on P-dogs. In this video Gavin Gear test the .224 Valkyrie cartridge in both AR and bolt-action rifles. Using a drone to capture images of shots on target, Gavin produces some impressively small groups at 600 yards. This shows that the .224 Valkyrie has serious accuracy potential when the load is right. In this 37-minute video on the “IraqVeteran8888″ channel, Chad tests a .224 Valkyrie rifle with various ammo, including 90gr handloads. The test addresses the pros and cons of this new cartridge, explaining the need to have realistic expectations, and a barrel with twist rate suitable for your bullet choices. This is a long video, but worth watching if you are contemplating building or buying a .224 Valkyrie. This follow-up IraqVet888 video focuses on reloading for the .224 Valkyrie. Chad addresses a multitude of issues including: powder selection, bullet options, brass longevity and primer pocket uniforming. If you own a .224 Valkyrie and hand-load for the rifle, you should watch this video. Here Gavin Gear tests Starline’s new .224 Valkyrie brass, seeing how well it stands up to repeated firings. Gavin checked for primer pocket stretching and found that 50% of the cases went 8 or more firings before the primer pockets grew too much. However a few cases did need to be retired after four firings. Gavin notes: “Brass longevity is one of the key considerations for loading 224 Valkyrie, so I thought I would put my Starline 224 Valkyrie cases to the test! Be sure to read the full Brass Test article for more insights. The .224 Valkyrie has been marketed as a low-recoil round that can stay supersonic to 1300 yards and beyond (with 90gr Sierra MatchKings). 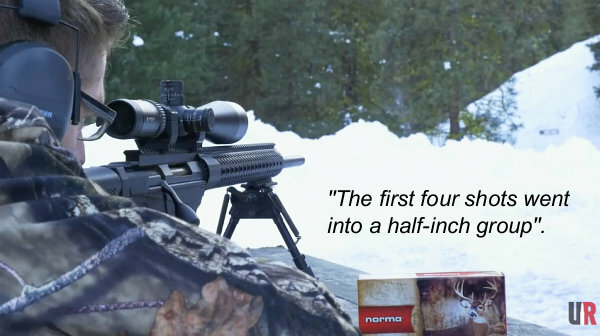 Here a Sniper’s Hide duo shots an AR-platform .224 Valkyrie at distances out to 1550+ yards. To be honest, the accuracy wasn’t that impressive. However this test confirms that the .224 Valkyrie does launch the long, heavy projectiles at high enough velocities to prove superior to the standard .223 Rem. Frank Galli (aka “Lowlight”) teams up with Brian Whalen of Colorado Precision Rifle at the Blue Steel Ranch in New Mexico. 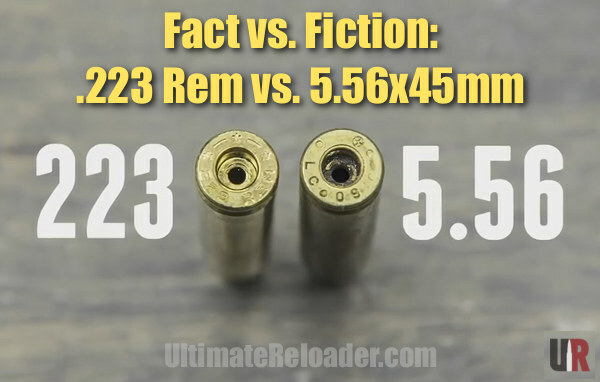 Share the post "224 Valkyrie Video Showcase — Field Tests and Reloading Info"
To explain the key differences between the .223 Rem and 5.56x45mm cartridges our friend Gavin Gear of UltimateReloader.com has created a very thorough 12-minute video. This covers the cartridge specifications and explains key considerations for hand-loaders. 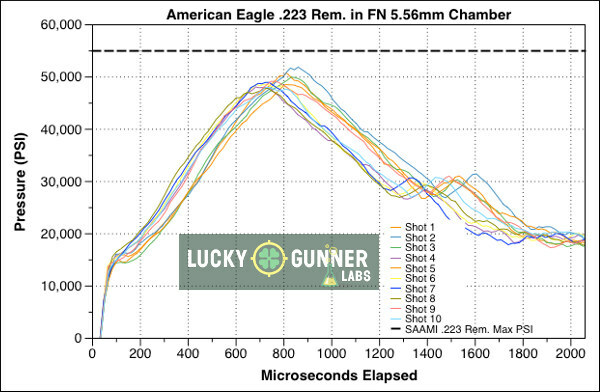 Gavin also addresses the oft-asked question “Can I shoot 5.56x45mm ammo in my .223 Rem chamber?” Gavin’s video is definitely worth watching. In fact, this is one of the most popular videos Gavin has ever created — it has been watched over 300,000 times on YouTube. What Exactly Is the 5.56x45mm NATO Cartridge? The 5.56×45mm NATO is a rimless bottle-necked intermediate cartridge family standardized by NATO with development work by FN Herstal. It consists of the SS109, SS110, and SS111 cartridges. Under STANAG 4172, it is a standard cartridge for NATO forces as well as many non-NATO countries. “I have received a slew of questions — many from first time AR-type rifle buyers — about the .223 Rem and the 5.56×45 mm NATO cartridges. Can I shoot 5.56×45 mm NATO in my .223 and vice-versa? Are these the same cartridge? * According to the official NATO proofing guidelines, the 5.56×45mm NATO case can handle up to 430.0 MPa (62,366 psi) piezo service pressure. The U.S. SAAMI lists Maximum Average Pressure (MAP) for the .223 Remington cartridge as 55,000 psi (379.2 MPa) piezo pressure with deviation of up to 58,000 psi (399.9 MPa). The chamber for military 5.56×45mm NATO has a longer throat prior to the bullet contacting the rifling which results in lower pressures when firing 5.56×45mm NATO ammunition. If 5.56×45mm NATO is used in rifles chambered for .223 Remington the bullet will be engraving the rifling when chambered. which can increase pressures past SAAMI Max levels. NOTE: The C.I.P. standards for the C.I.P. civilian .223 Remington chamber are much closer to the military 5.56×45mm NATO chamber. ** The full-length LuckyGunner article is well worth reading. It even provides specifications for a number of .223 Rem reamer types, and compares the original .223 Rem, the 5.56x45mm NATO, and the modern .223 Wylde chamberings. 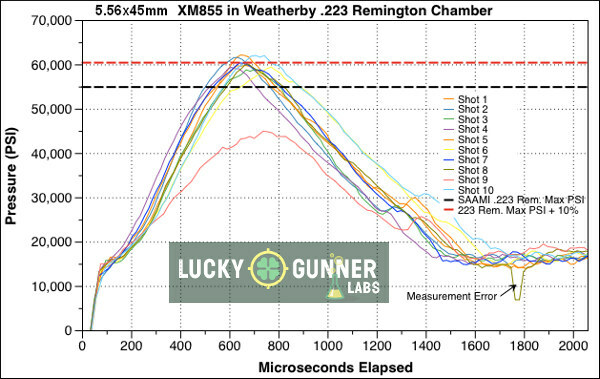 Share the post ".223 Remington vs. 5.56x45mm — Facts vs. Fiction"
In this 11-minute video Gavin reviews MagnetoSpeed’s top-of-the-line V3 Chronograph. He shows what ships with the unit, how to set it up for both rifles and pistols, and then he puts it through its paces showing how it captures velocity data. 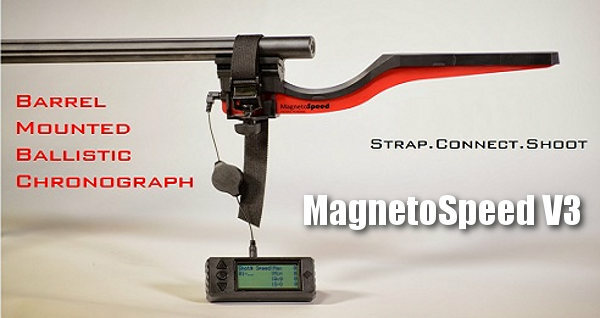 Gavin says he will follow-up with future videos showing how to link the MagnetoSpeed V3 to your mobile phone and how to log velocity data for future reference. To learn more about this high-tech chrono, visit UltimateReloader.com. Share the post "Gear Review: MagnetoSpeed V3 Tested by UltimateReloader"
Midsouth Shooters Supply is running a big sale right on Lyman’s impressive new Brass Smith line of reloading presses. There are three models, each offering great performance and value for its class. 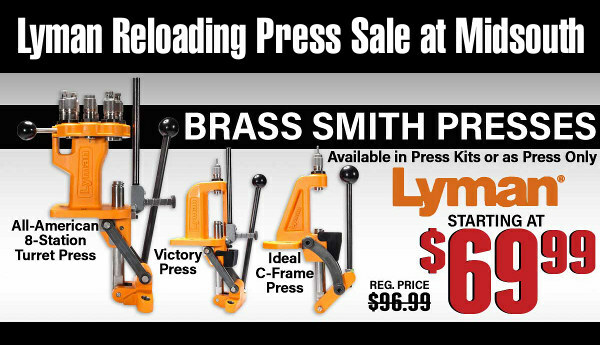 You can save quite a bit of cash with this Midsouth Lyman Press sale. If you haven’t tried orange yet, we think you’ll be impressed. The little C-Frame is a steal at $69.99. 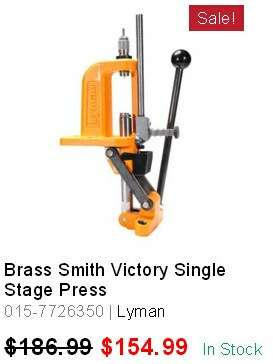 Lyman’s New Victory Single Stage Press competes with the RCBS Rock Chucker Press. If you like to prime on a press, this Victory has a priming system that’s much easier to use than the Rock Chucker system. With beefy Cast-Iron construction, strength and leverage is on a par with the Rock Chucker. With a cast-iron frame, the Ideal C-Frame (open-front) press is stiffer than other small presses in this class. It is an excellent choice as an affordable, secondary press for your loading room, or a press to use at the range. The new All American 8-Station Turret press sets a new capacity standard in a turret press. You get EIGHT stations, compared to 7 for a Redding turret and 6 for an RCBS turret. Lyman has also included a rear support that increase rigidity, reducing turret vertical displacement during loading. That helps load consistency. 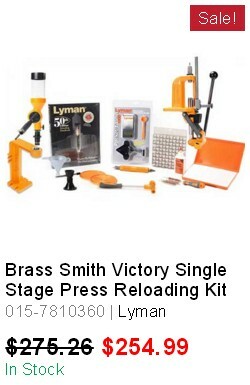 NOTE: Along with the three individual presses, Lyman offers complete reloading kits combining the presses with powder measures, scales, and reloading tools. These kits are also on sale now at Midsouth. Share the post "Lyman Brass Smith Presses on Sale at Midsouth"
If you load pistol ammo you should have a case gauge (aka “gage”) for each cartridge type you reload. Caliber-specific, precision-machined cylindrical gauges perform many important functions. They will instantly reveal if your rounds are too long or have excessive headspace. They will also show if your case is bulged or otherwise too fat to chamber easily. You can use the gauge with sized brass as well as loaded rounds. 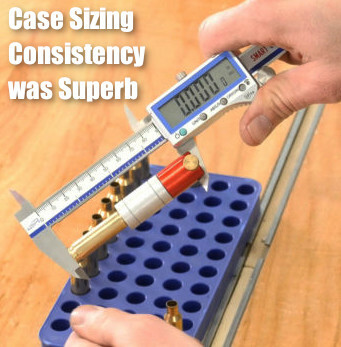 Case gauges are a “must-have” for anyone loading handgun ammunition, particularly if you crank out large quantities of pistol ammo with a progressive press. An oversize round can cause a misfeed, jam, or other problem. That can ruin your day if you are in the middle of a shooting match. If you are relying on your handgun for self-defense, the last thing you want is a malfunction of any kind. This Editor personally runs every pistol round through a gauge before it goes into the ammo box. Our friend Gavin Gear of UltimateReloader.com has prepared an excellent video that explains the benefits of pistol case gauges and shows how to use them. Gavin uses the quality gages produced by L.E. Wilson. These are available for the most popular handgun cartridges, both autoloader cartridges, and rimmed revolver cartridges. Gavin demonstrates gage use with .40 SW and .44 magnum cases. 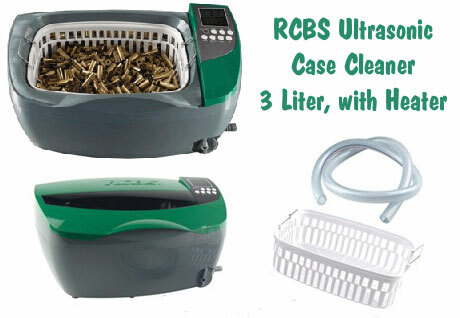 Ulimate Reloader.com also covers the use of case gauges for rifle cartridges. Rifle cartridge gauges are especially useful in detecting headspace problems. Case gauges can avert many problems, particularly if you reload milsurp rifle brass. CLICK HERE for Rifle Case Gauge “How To” and Video. 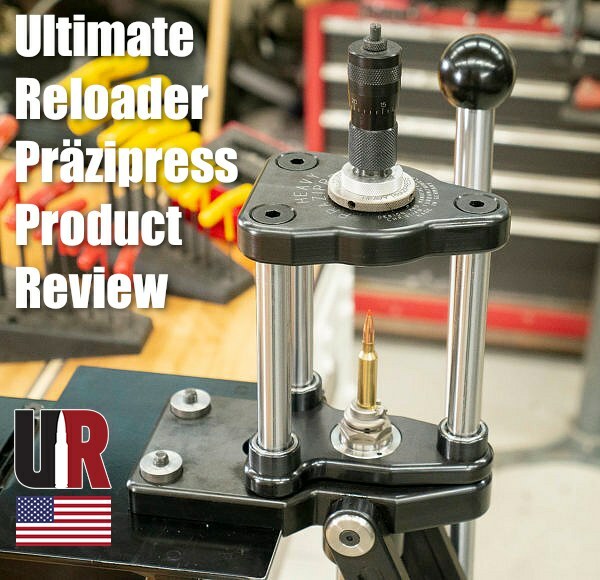 Share the post "UltimateReloader Video Demonstrates Pistol Case Gauges"
In this DVD, Ultimate Reloader’s Gavin Gear guides you through the entire process including selecting components, acquiring and using the necessary tools, assembly steps and details for each component, and even mounting a scope. Building an AR-15 can be overwhelming, but with the right guidance and help it’s not difficult and can be very rewarding. With this DVD you’ll be able to build your AR-15 with confidence. To preview the AR Build DVD, check out this YouTube video from UltimateReloader.com. This 12-minute video shows the basics of assembling a standard AR15 with Del-ton components. Gavin shows how to install the AR trigger group and other parts in an AR-15 lower. You’ll also see the basics of barrel and handguard installation. This video covers the highlights, but we strongly recommend you buy the full DVD before starting your first AR-15 build. 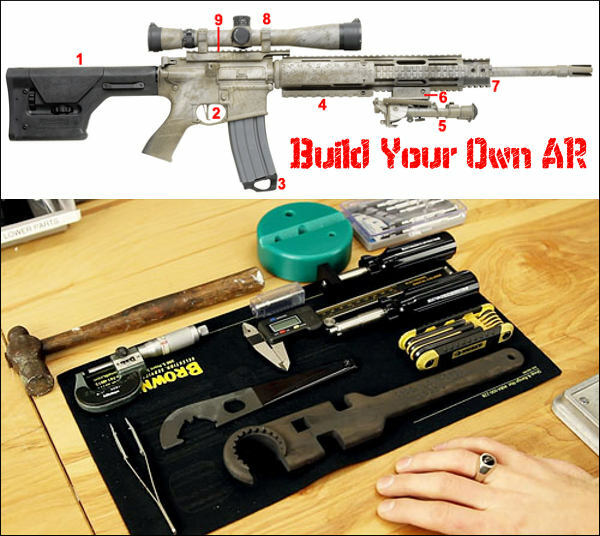 Share the post "How to Build Your Own AR-15 — Step-by-Step"
When you need ammo fast — lots of ammo, it’s hard to beat a progressive reloading press for output. 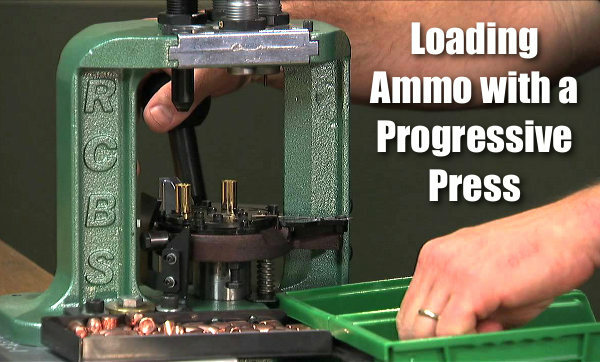 We use progressive presses to load handgun ammo and .223 Rem cartridges for varmint safaris. With good dies, and proper press set-up, today’s progressive presses can produce surprisingly uniform and accurate ammo. No, you won’t see Benchrest Hall-of-Famers loading PPC cartridges on progressives. However, if you need 1000 rounds for your next prairie dog adventure, you should consider getting a progressive. Below you can see a Hornady Lock-N-Load AP configured to load .308 Winchester in bulk. Inspect brass for cracks, deep dents, etc. For military brass: de-prime, ream/swage primer pockets, size with small-base sizer die (small base usually optional). Measure brass length — if too long, size and then trim. Cleaning primer pockets may be something you’ll consider (I don’t clean primer pockets except for rare cases or match ammo). Since you’re loading rifle ammunition on a progressive, you’re already saving a load of time, so there’s no need to rush things! Attention to detail is super-important for safety and for good results. Always keep an eye on powder level (goes down FAST) and what’s happening at each station. 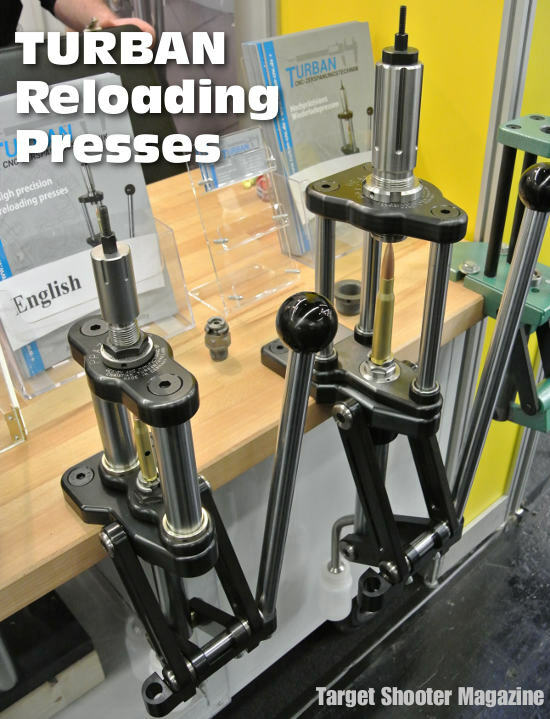 Look for a heavy-duty, well-built press that will stand up to rifle loading. You’ll also want to make sure your powder measure will have the proper capacity (~25 grains for .223, ~50 grains for 308). If you are bulk reloading, ensure you have enough stations for sizing, charging, powder check, bullet feed, bullet seating, and (optional) bullet crimp. 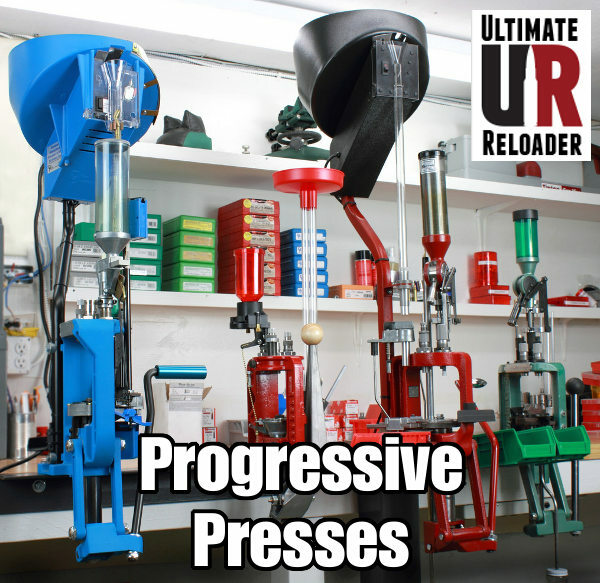 Share the post "Getting the Most Out of Your Progressive Press — PowerUser Tips"
Everyone needs a serious, full-size single-stage press such as the RCBS Rock Chucker for heavy-duty reloading tasks. But’s it’s also wise to have a smaller, more compact press for lighter duties such as decapping (primer removal), neck-sizing, and bullet seating. 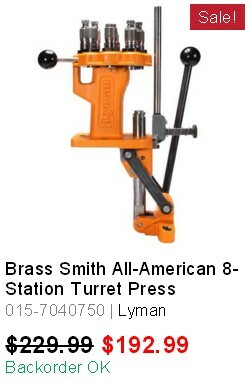 The new Lyman Brass Smith Ideal press fits that role perfectly, at an affordable price — about $80.00 retail. With an $80 street price, Lyman’s new C-Frame press is an exceptional value. With beefy cast-iron construction, it is much stiffer than other presses in this compact category. The compound linkage is smooth. The base is big enough to provide good stability. For someone looking for a second press, or a smaller press to take to the range, the new Lyman Ideal may be the smart solution. The large opening and C frame design allows you to access the shell holder without hitting the support bar on other types of presses. Changing shell holders is a breeze and the press holds standard 7/8″x14 TPI dies from any manufacturer. The high quality steel ram is one inch in diameter and the 3 7/8″ opening allows you to reload cartridges up to 3.7 inches tall. 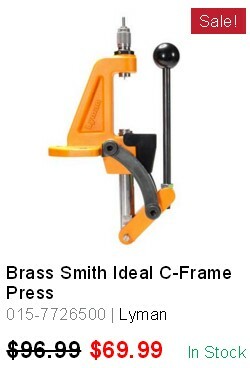 The Brass Smith is a true ambidextrous press that can be accessed from either side and mounted the same. 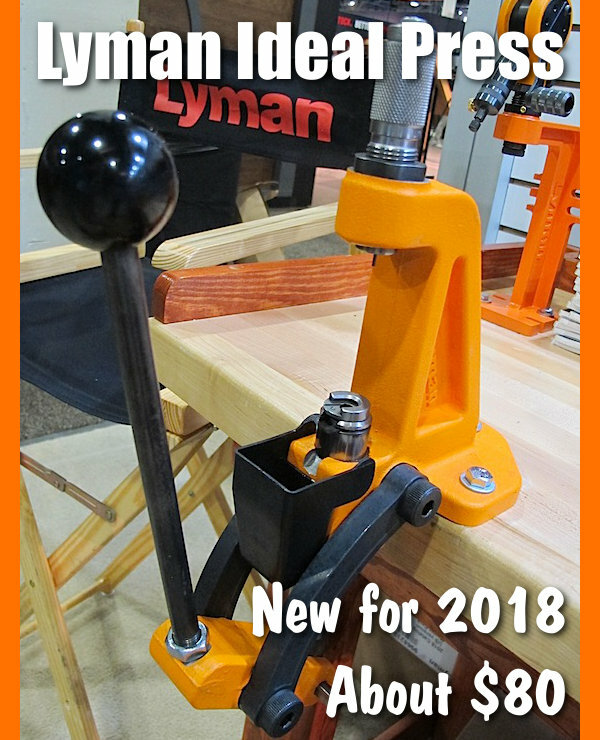 Share the post "New Affordable Cast-Iron C-Frame Press from Lyman"
Our friend Gavin of UltimateReloader.com has a new tool — the second generation Lyman Borecam. This upgraded version features higher-resolution 300K output so you can better see details inside your barrel. 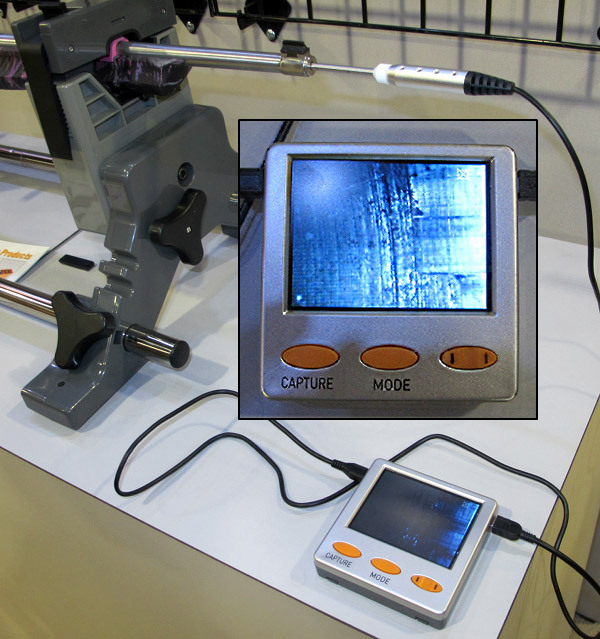 This digital borescope can also be used to inspect the interior of dies and other tools. Illumination, via LED, is adjustable. Record still images with the push of a button. The screen resolution for the latest Lyman Borecam is now 640×480, roughly 300,000 pixels (300K). 1. Borecam Wand (includes handle, rod, mirror, and digital lens/camera) with length indication scale. An inch scale runs the full length of the rod. That tells you where the lens is positioned inside the bore. Note the wand scale marks when recording screen captures. 2. 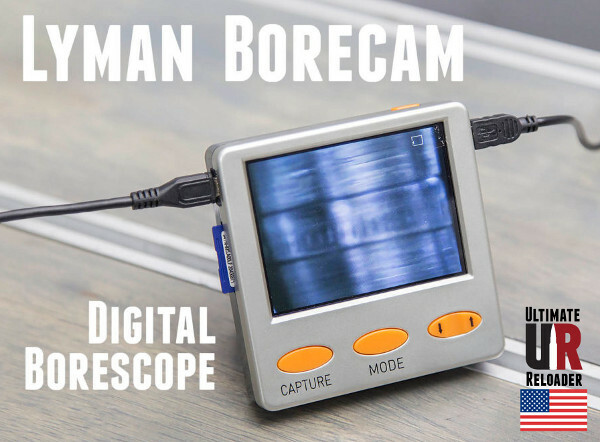 Borecam Digital Display. The 600×480 display can record stills with included 128MB SD Card. A USB SD Card adapter is included. 3. Borecam Mirror Protector and cleaning kit. 4. AC Power Adapter (not shown, international plug adapters included). — First, before you start, make sure the mirror is clear and free of dirt, lint, or solvents. — Use the Up and Down Arrows to adjust the illumination to suit your barrel. — Experiment with how close you hold the mirror to the wall of the bore. This affects both brightness and focus. Share the post "Lyman Borecam Video Review by UltimateReloader.com"
Thinking of trying out the Precision Rifle Series, starting off with a gas gun? Well Gavin Gear of UltimateReloader.com did just that, competing in his first-ever PRS match up in Washington State. With its timed stages (some just 90 seconds long), Gavin learned that PRS is about speed as well as accuracy. 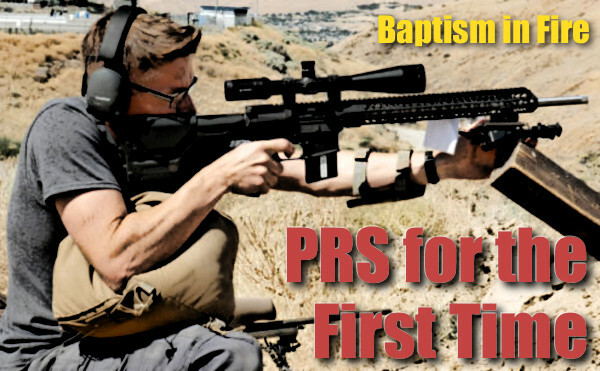 As a PRS newbie, Gavin found the competition fun but challenging. Gavin’s account of his experiences, set forth in two articles with accompanying videos, will help other novice PRS competitors prepare for PRS-type matches and assemble the right equipment. Gavin did experience issues with his “stout” 22 Nosler loads: “I did run into some trouble — I had loaded my 22 Nosler rounds to max charge weight with Varget powder and experienced some failure-to-feed issues during the match. Initially I thought my bolt needed more lubrication, but [it was] between 96 – 100°F during the hottest part of the Match day.” With the ultra-high ambient temperatures, Gavin experienced over-pressure. Word to the wise — “Test everything you plan to use on match day, and take into account things like weather conditions as well”. Action Type — Bolt vs. Semi: While most PRS competitors use bolt-action rifles, there are classes of competition that specifically call for semi-automatic actions to be used. Even so, in Open Class where you can pick which action type you’d like to use, there’s a split between the two for various reasons. I used an AR-15 in my first match, and for comparison, I think I’ll use a bolt-action rifle in my next match! 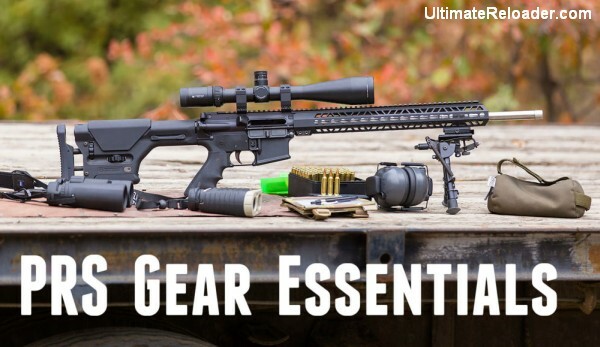 UltimateReloader.com’s PRS Gear Summary covers Rifle Choice (gas gun vs. bolt-action), chambering options, optics, support systems (bipods and bags), dope cards, accessories and much more. Both novice and experienced PRS competitors will find this article well worth reading. 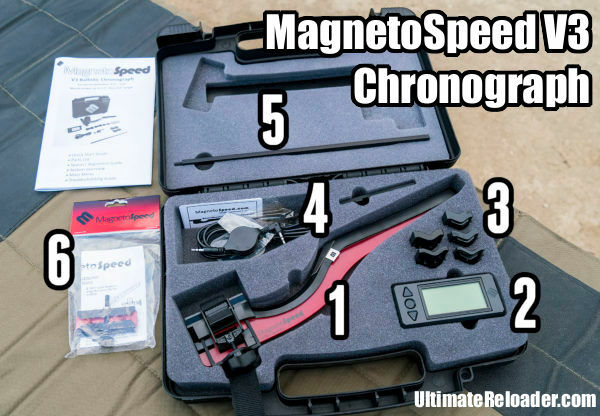 Share the post "PRS for the Very First Time — Gavin Gear Goes Gas Gun"
Share the post "MagnetoSpeed V3 Chrono Review by UltimateReloader.com"
Do your hands/wrists get tired when prepping scores of cartridge cases? There’s an alternative to the big, costly case prep centers that occupy lots of space on your reloading bench. Little Crow Gunworks has developed a $29.95 hand tool that makes chamfering by hand much easier. You’ve got to watch this Precision Prep Tool in action — click on the VIDEO below to see Gavin Gear of UltimateReloader.com demonstrate how it works. See How Tool Head Spins With Arm Movement — Very Clever! With this tool, a natural motion of the forearm translates into rotary motion of the tool head (watch the video!). The tool-head holds four (4) tools: inside and outside neck chamfer tools, plus large and small primer pocket reamers. A hex adapter lets you use the primer pocket reamers with a power drill to remove the crimps on military brass. This is the first manually-operated case prep tool that puts four tools at your fingertips. 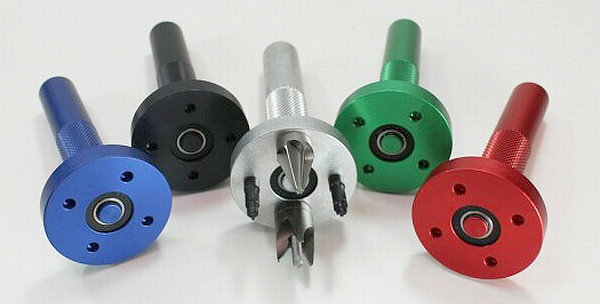 Other single-head inline tools require the user to twist their wrist or rotate the tool in their hand. The PPT consists of a knurled solid aluminum handle with a bearing-mounted aluminum tool head. 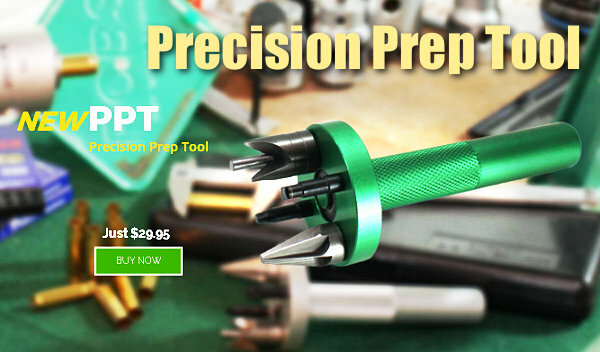 The tool head has four 8-32 tapped holes which accept case prep tools manufactured by most reloading companies. To use the tool, simply rotate your forearm in a clockwise motion to chamfer, deburr, or clean the primer pocket. Priced at $29.95, the tool comes in five (5) colors: Red, Blue, Green, Silver, and Black. Share the post "Cool Tool — New Case Prep Tool with Spinning Head"
When you make a reloading mistake, you may need to “pull down” assembled ammo. 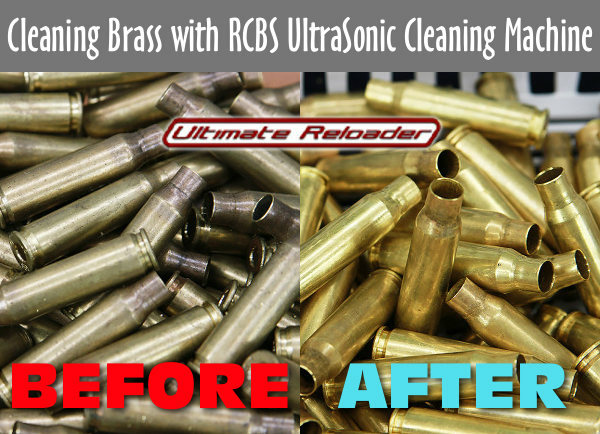 The embedded UltimateReloader.com video demonstrates how to use the Hornady Cam-Lock bullet pulling system. Not knowing just when his powder measure started delivering too much powder, Gavin decided, for safety’s sake, to pull down all the ammo he had just reloaded. Yes that’s time-consuming, but it’s better than the alternative — having a dangerous Kaboom while shooting. With fast-burning pistol powders, a two-grain over-charge could cause a blown case, damaged firearm, and/or serious injury. Use of Bullet Puller starts 4:00 minutes into video. To pull down a loaded round, first place the cartridge in the shellholder on your press ram. Then raise the round up into the bullet puller device installed where a die would go. The Hornady Cam-lock bullet puller works by clamping the bullet in a collet when you flip down the red-coated lever. Then, with the case held by the rim in the shell-holder, the bullet exits the cartridge as the press ram is lowered. It takes time, but it’s pretty fool-proof once you get the hang of it. This entire process is illustrated in Gavin’s video, starting near the four-minute mark. 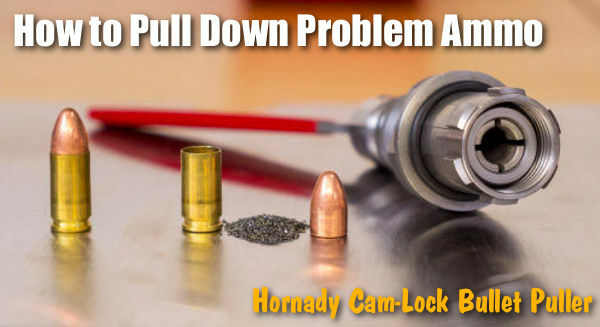 The Hornady Cam Lock Bullet Puller has four (4) key components: 1. 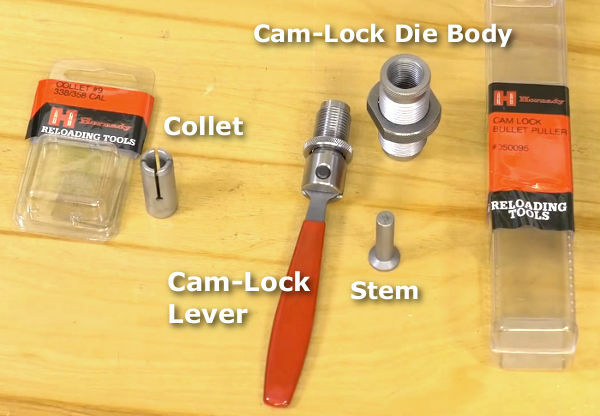 Cam-Lock die body; 2. Cam-Lock lever; 3. Stem; and 4. Collet (Caliber-specific). NOTE: In order to use this tool, you’ll need the appropriate collet for each diameter range of bullets you intend to pull. For example use collet #3 for 6mm, collect #6 for 7mm, and collet #7 for .308 Caliber. 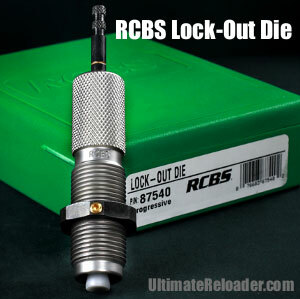 A good safety option for users with progressive presses is the RCBS Lock-Out Die. This has a charge detection rod that dips into each case after powder has dropped. You adjust the die to the proper charge height for your desired load. If the actual dispensed charge is too high or too low, the Lock-Out Die senses the problem and stops the press from advancing to the next case (it does this by preventing the ram/shellplate from fully elevating). We’ve used the Lock-out die with great success for both pistol and rifle cartridges. It’s sensitive to about one-half grain with pistol powders. This Lock-Out Die can work with Hornady and Dillon progressives as well as with RCBS progressives. However, it does take up one die station on the press. Share the post "How to Use a Collet-Type Bullet Puller"
We were impressed when we first saw the new MEC Marksman press. Created by the makers of the popular MEC shotshell reloading systems, the new Marksman combines a sturdy cast-iron frame with a modern open-front design. With a $225.00 MSRP it is more expensive than an RCBS Rock Chucker, but it offers some distinct advantages — such as the open front plus a floating shell-holder system. CLICK HERE for REVIEW of MEC Marksman Single-Stage Press on UltimateReloader.com. Gavin liked the Marksman’s system for holding spent primers. A tray sits behind the ram to catch spent primers exiting from a hole near the bottom of the ram. This is more foolproof than the plastic primer cups on some other single-stage presses. Expect less spent primer “spillage”. The Marksman is sold as a stand-alone unit. However MEC also offers a very nice steel mount/riser for the Marksman. Gavin tested the Marksman with this riser, and he says it was sturdy and well-built. Gavin liked the riser. He said that elevating the Markman press up above the benchtop made it easier to handle cases and to operate the handle. You also get extra left- and right-side die-holders. 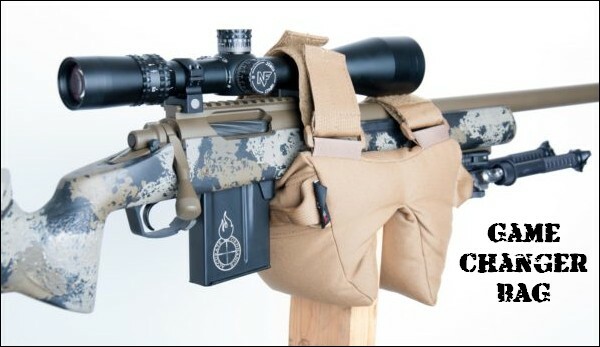 Share the post "MEC Marksman Press Review on UltimateReloader.com"